This 25in LCD TV from Hannspree sports a Full HD resolution of 1,920 x 1,080 pixels and is the smallest Full HD panel we've seen so far. Whether that 1080p standard is really worthwhile on a set of this size remains to be seen. The slender design also features a glossy black bezel that doesn't exactly exude an air of luxury, but is attractive enough even if it does tend to get covered in smudgy fingerprints all too easily. In terms of connections, the ST251MAB is relatively standard, although the inclusion of two HDMI ports seems generous on a screen in this price range. You'll also find most of the usual suspects including a Scart, component and composite video along with the added bonus of a PC port, which means that it can double as a computer monitor. Both the set-up menus and EPG are logically designed and easy to use. However, compared to some of the latest on-screen interfaces from rival manufacturers they do look a little dull and dated. Likewise, although the remote control is perfectly comfortable and easy to use, the design isn't too exciting. Freeview broadcasts appear slightly pixelated, while there is a significant amount of blurring on moving images. Colour tones are also rather unrealistic and the frequently visible backlight doesn't help matters. The upside is an impressively wide viewing angle. Performance from DVD is noticeably better, while pictures from an HD source are better still. When playing a Blu-ray disc, pictures are significantly sharper with fine detail captured beautifully. Peak whites are also impressive, and there's even a marked improvement in the albeit mediocre black level. As predicted, the panel doesn't really live up to its full HD potential, due to its small screen dimensions and the lack of processing technology present on most TVs with a full HD resolution. We didn't have high expectations of the speakers and were proved correct. While they don't sound tinny, the sonics are decidedly average, particularly on bass-laden movie soundtracks. 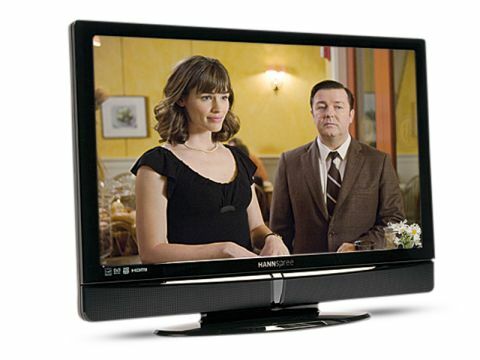 At just £250, this 25-incher costs far less than most of its 26in rivals and is a good choice if you're after a decent-sized second room model.